The first full-body X-ray image (a compilation). An effective tool for diagnosing internal disease. From Roentgen’s Ray, p. 8.
locating foreign objects within the body. Mobile units developed for use in World War I field hospitals enabled surgeons to locate shrapnel, bullets, and internal injuries within injured soldiers quickly, dramatically reducing mortality rates. Back home, X-ray had become invaluable to the practice of emergency and clinical medicine. French advertising postcard, circa 1896. Like most developing technologies, progress came at a cost. The earliest units required large generators. Noise, sparks, and exhaust made the imaging experience dangerous and extremely unpleasant for both doctors and patients. Poor regulation, inadequate training of technicians and doctors by product salesman, and a society’s hunger for the latest miracle cure did nothing to invalidate the countless false claims as to the X-ray’s capabilities. 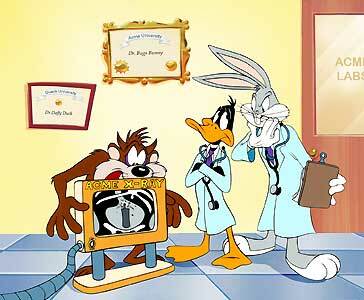 X-rays could whiten dark skin, remove unwanted body hair, and rejuvenate the mind. 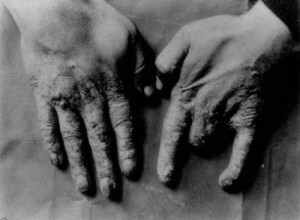 Radiation burns were often induced intentionally; these were proof of the effective treatment promised by doctors and expected by their patients. In retrospect, these irresponsible practices are far more disturbing given what we know about radiation’s power to harm as well as heal. 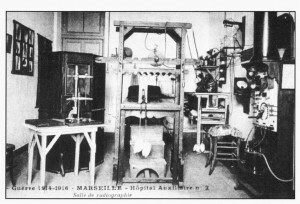 Early X-ray machines subjected patients (and operators) to 1500x more radiation than those used today. It might take 90 minutes of exposure to obtain an adequate image; today it takes 21 milliseconds. And even now debate continues over the risks of yearly mammograms and airport body scanners. Clarence Dally, Thomas Edison’s faithful assistant, paid the price for his loyalty—essentially taking the hit for his boss. The repeated exposure he sustained through years of experimentation took a dreadful toll. 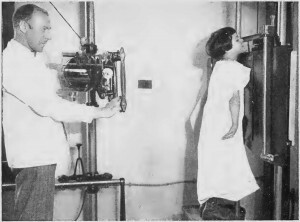 Having begun working with the fluoroscope in 1896, by 1900 his hands were destroyed by cancer. Spreading disease resulted in the amputation of both arms. The cause was no mystery, and in 1903 Edison stopped working with X-rays, citing health concerns (he had himself been experiencing eye trouble). 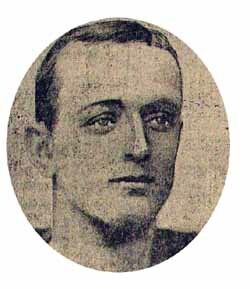 Dally died in 1904. In the papers, he was celebrated and mourned as a “martyr to science.” The citizenry was changing its mind as well. As the very real dangers of prolonged radiation exposure became visible in patients’ bodies, increasing numbers practitioners were sued. This may well have helped launch the field of medical malpractice law. Both this and the subsequent improvements in technology began to shift public attitudes. While the X-ray still possessed its “magic” qualities—revealing interiority, suggesting an invisible or deathly world—it also became more definitively the province of science, and less a form of “popular physics” accessible to the layperson or home enthusiast. Elizabeth Cole, Roentgen’s Ray: A Story Of The Discovery Of A Light That Was Never On Land Or Sea. 1935. Tal Golan, “The Emergence of the Silent Witness: The Legal and Medical Reception of X-rays in the USA.” Social Studies of Science, Vol. 34, No. 4 (Aug., 2004), pp. 469-499. Retrieved February 14, 2014. Gilbert King, “Clarence Dally – the Man who gave Edison X-ray vision.” Retrieved April 18, 2014.3. Hugh O’Connor, “Science at the Fair.” New York Times. May 28, 1939. Retrieved April 18, 2014.Guy et Marie-José Pallardy, “Cartophilie et radiations: une contribution appréciable àl’histoire de la radiologie.”Histoire des Sciences Médicales. XXXIII: 3, 1999. pp. 231-242.